I teach barefoot, practice yoga barefoot, and live in a shoe-free house. 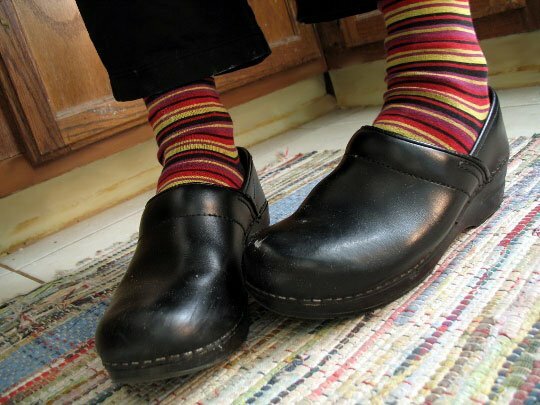 Most days, I wear clogs that I can kick off easily even with my hands full. A while ago I noticed that whenever I take off my shoes, I take my right shoe off first. Every time. Right shoe first. This may not strike you as an earth-shattering news flash. That’s because it isn’t. Who cares, right? What difference does it make? None. No difference. It doesn’t matter. But here’s what’s more interesting to me. For about two years, I’ve said to myself, “When you take your shoes off, take your left one off first.” For the fun of it, I set an intention to break my right-shoe-first habit. And here’s the thing: in two years and hundreds of unshoddings, I’ve managed to take my left shoe off first all of three, maybe four, times. I’ll be standing in the mud room and before I can stop myself, I’m taking my right shoe off. I walk into yoga and – whoops – it’s my right clog that slides off first. Mindful practices of Nia, yoga, and meditation have helped me notice how I do what I do. This is always the first step toward change: paying attention and noticing what’s actually happening. Awareness alone is challenging: much of what we do is so deeply entrained in our bodies and minds that we do it automatically. Once we struggled and puzzled out how to brush teeth, drive, touch type, pour coffee. Then for efficiency’s sake, the brain flips into auto-pilot for those things and saves its gray cells for complicated tasks like refolding road maps and figuring out which TV remote to use. Habits are not just physical, though. Since adolescence, I have wobbled under the weight of a debilitating negative body image. I have spent years judging (what I saw as) too-big thighs, too-soft belly, too-wiggly arms, too-thick ankles and in general the not-enoughness of my body. I have a deeply ingrained habit of obsessing about my body and basing my worthiness and value on what I look like. This habit has scuttled me with a wake of shame, despair, fury, and grief. Untold amounts of time, energy, emotion, and resources have gone toward my negative body image habit. I’ve done every workout imaginable, dabbled in dozens of diets, and habitually beat myself up for the character flaw that is my physical form. Unlike taking my right shoe off first, this habit matters. It is exhausting and humiliating. It feels isolating and hopeless. It has filled me with misery and has distracted me away from the people and pursuits that I love. It is a habit of madness. Just like the right shoe off first habit, however, even when I realized I had a body-hating habit, even when I could see how damaging and painful it was, I kept finding myself in my old patterns. I told myself and others that I wanted to stop obsessing about my body. I made a commitment to love myself and be kind to myself. But no matter how many times I reminded myself that I didn’t want to do it anymore, I kept finding myself caught in the same loop of body-hating thoughts and feelings. This week, I launch a new routine called Brave — a routine that I have been working on in one way or another since I was 14 years old. Brave began with the title Body Love. I wanted to create a routine to embody a new habit of loving my body. Even grown in the weak soil of years of body-loathing, it has blossomed into much more than that. It is an act of courage to love my body. To love my physical form as I am right now with no changes is, as Brene Brown says, to dare greatly. Second, these body image habits are so old and this pain is so deep that I (and I posit that none of us) can do this alone. We need to stand up for ourselves and we need to stand up for each other. We need to gently but firmly tug each other out of painful patterns and to remind each other of our respective and collective awesomeness. And as I play with each song, as I weep over lyrics, as I uncover movements to tell this story, I see that proudly being ourselves, completely and fully, without apology, is the bravest thing any human being can do. To be myself without hiding the not-so-pretty bits, to be myself with gratitude and pleasure, to be myself without pretending and masking is Brave. I still slip my right shoe off first almost all of the time. And I still fall into my habits of criticizing and judging my body and wanting it to be different than it is. But I do recognize now what I’ve been doing to my body and myself. My body is my oldest friend and my most loyal companion. I have never done a single thing without her. She has stuck with me through everything and she has always done her very best for me. When I can remember and celebrate this, I break a long-held habit and start the healing. I know it will take a long time, probably all the rest of the time I have. I know I will fall back into my old habits, of course I will. And I want to make a commitment to pay attention and make a different choice. Who’s with me? * I am indebted to many for helping me create the playlist for Brave, including but not limited to: Christine Bergland, Jane Belisle, Joy Brown, Tamy Eustis Audrey Gelb, Pam Gibson, Kimber Hawkey, Virginia Hill, Beth Kariel, Anna Mairs, Sara Marks, Lynette Meynig, Laura Parsons, June Rivers, Kellie Silico, Joy Tanksley, Todd Waters. Especially since I’ve been on radio silence for most of the past year, I could never have found all this music without you. Thank you! In May, my friend, in May. You and I will dance Gaga together! Thank you, Samuel. You keep rockin’ the left coast bravely and I’ll keep doing it on the right. Awesome post Susan. And brave, very brave. Thank you, TRex. I’m braver with you around, for sure.